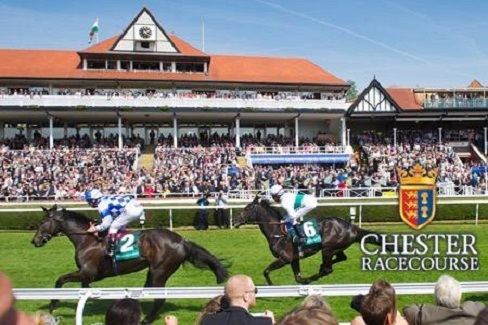 Moving on to Sunday we have interesting listed sprint race from Chester .8 runners declared for the 6F Queensferry stakes on ground described as good . The three main contenders look to be Kimberella , Major Jumbo & Fighting Irish . KIMBERELLA : 8-Y-0 Bay Gelding ,winning 11 out 70 on turf .Has decent record here at Chester winning three times at the track ,including winning this race last year .Has shown some decent form this season ,including winning 7f conditions race at Thirsk in April .Also finished creditable nose second behind the useful Sir Dancelot in conditions race at Hamilton in June.Will need to bounce back after two below par efforts,though will be suited returning to Chester over 6f , looks well drawn in stall 2.Solid claims . MAJOR JUMBO : 4-Y-0 Grey Gelding ,winning 4 out 17 on turf .Been in good form this season ,winning class 3 handicap at Newmarket in April off mark 94 ,also finished excellent thirds in Wokingham handicap at Royal Ascot in June & the Heritage Handicap last month ,off mark 103 .Takes step up into listed company.Should go well, looks well drawn for front runner in stall 1 . FIGHTING IRISH :3-Y-0 Bay Colt ,winning 3 out 10 .Progressive sort ,had some decent form as two-year old ,winning 3 times ,including winning group two in France.Not won in 4 starts this season ,though has been highly tried in group company ,however did finishing fair 8th of 22 in group one Commonwealth Cup at Royal Ascot last time .Will be suited by this drop in class ,should be thereabouts . VERDICT : Last years winner KIMBERELLA will need bounce back after couple below par efforts ,though had some decent form earlier in the season .Will be suited returning to Chester over this C&D .Odds around 4-1 look decent each-way value from good draw . Major Jumbo looks the obvious danger ,after running some excellent races in some the big sprint handicaps this season ,though odds around 7-4 look very short on his first start in listed company. Thanks Mate ,nice price .That was well overdue ! !